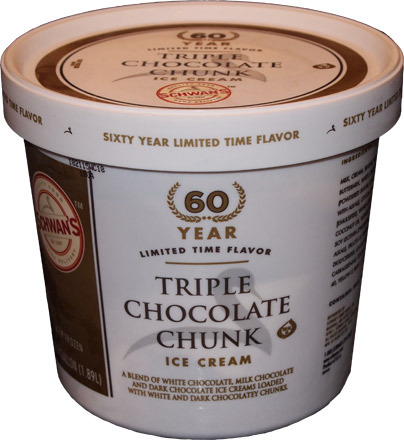 [New for 2012] To celebrate the 60th anniversary of the very first Schwan's ice cream delivery, Schwan's has released a limited edition flavor. I haven't personally tried the service yet, but I know one of my neighbors gets a delivery every week, so there's an endorsement right there. As fair warning, I got this sample for free. If you want to try it, it's #302 on the Schwan's website. Does that simple white container seem kind of large? Well it should - it's a full half gallon! WOOHOO! Bring back the good old days! That is the prettiest ice cream ever. Every now and then someone leaves the comment "who cares what it looks like?" Well, I care for starters. There is something magical about the way this one looks. I mean, come on, this is art right here! See? You could frame this stuff! At this point, it could taste like dirt, I wouldn't care. Oh, alright, let's talk about the taste. 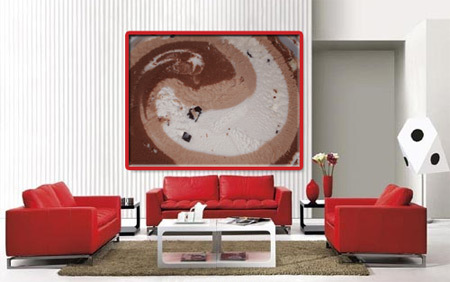 Not only is the ice cream gorgeous, it's having fun too. 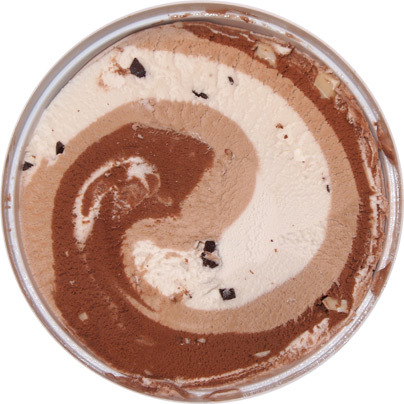 They've ingeniously thrown white chocolate chunks in the dark chocolate ice cream while throwing dark chocolate chunks in the white chocolate ice cream. Come on, that's bloody brilliant right there. 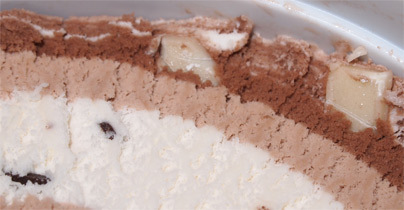 Look close and you'll notice they are big sized chunks too, the kind you might find at your local scoop shop. They've got that nice solid crunchy thud and I enjoyed every one of them. I just wish there were more of them. You don't hit them often, and when you do, it's much more of a textural change than a flavor change. 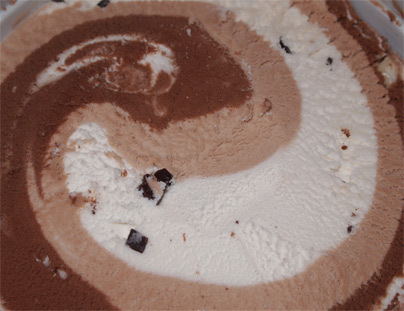 Now textural wise this is a respectable ice cream. I wasn't really picking up any gumminess which is always appreciated. Overall it's a little soft and melted a little quicker than expected. I like it though. The flavors are the final piece and I saved them for last because when a swirl is involved, it's not always easy to differentiate them, especially when they are all variations of chocolate. I definitely get a milk chocolate vibe similar to Turkey Hill's Box of Chocolates. The dark chocolate is, well, I kept scooping it with the other chocolates. I do detect notes of a richer, darker chocolate, but it's mixing in with the other two flavors. The final bit is the white chocolate ice cream.... and here lies my only compliant with this flavor. When I scooped the first few bowls, there was a mix of all three chocolates. However, my wife said she noticed a chemical note to her bowl which had wound up being mostly white chocolate. On my second scoop, I too had a bowl with a majority of white chocolate and there is definitely something there. I don't know if chemical is the right word, but there is definitely something there. Maybe it's the way the white chocolate flavoring blends with the ice cream, I don't know for sure. The good news is that you don't really eat a flavor like this one at a time. I spent 95% of my time scooping all three at once to give a nice balanced flavor. Overall I like it, I really do. It's a fun flavor that's well made. You can tell they put a lot of thought in here. The three chocolate blend is something I haven't seen since Breyer's Triple Chocolate 3 years ago. It's also a respectable flavor substitute for Box of Chocolates which is only available in February. So, don't be afraid to try this one. It's running a 4.5 out of 5 star rating on Schwan's website. My 1st thot at that top pics was also how pretty it was b4 i even read u said the same thing! Maybe the chemical taste is the fact that white choc isnt really choc.? Its basically just fat/lard and whatever other junk(chemicals)they add 2 make it palatable.